Meet the people who are guiding CNO Financial Group as a leading provider of insurance products to middle-income working and retired Americans. Chief Executive Officer, CNO Financial Group, Inc.
Gary C. Bhojwani became chief executive officer of CNO Financial Group on January 1, 2018. He was elected a director of CNO Financial in May 2017 and serves as a member of the Executive and Investment Committees. Bhojwani previously served as president of CNO Financial from April 2016 through December 2017. His areas of responsibility included overseeing CNO's three business segments—Bankers Life, Colonial Penn and Washington National—as well as marketing, underwriting and new business. Prior to joining CNO, Bhojwani was a member of the Board of Management of Allianz SE from 2012 to 2015. He was chief executive officer of Allianz Life Insurance Company of North America from 2007 through 2012, and was president of Commercial Business, Fireman's Fund Insurance Company from 2004 to 2007. Bhojwani was chief executive officer of Lincoln General Insurance Company from 2002 to 2004, founder and chief executive officer of Avalon Risk Management from 1998 to 2002 and president, Trade Insurance Services from 1995 to 1997. He holds a Bachelor of Science degree in actuarial science from the University of Illinois and a Master of Business Administration, with dual concentrations in finance and marketing, from the University of Chicago. 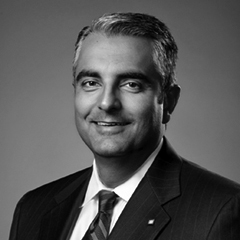 Bhojwani is a current board member of Allina Health, Hormel Foods and the American Council of Life Insurers; and a past board member of the Financial Services Roundtable and U.S. Chamber of Commerce.